With so many events to attend this season, the one must have is a festive bag small enough for evening glamour, but large enough to hold absolute essentials. I purchased two incredible envelope-style designer clutches last year and they just won't do for this particular season. I need to be able to take photos, communicate and have enough 'touch up' product to take me from office to full blown Christmas celebrations to music awards ceremonies and concerts. Thank goodness, a new store has just opened at The Mall at Green Hills that has the best solution. Elaine Turner may not be a household name in Nashville yet... but in a short time, I'm betting that their bags and accessories are going to be on every woman's wish list. The store decor invites you to browse and relax, but it's the bags that showcase the designer's (who hails from Texas) talent most. I am so in love with my find. It even has a name, Blythe. I chose the bronze metallic so that I can mix it up with both black and brown ensembles. I love the fact that it has a snazzy shoulder strap to keep my hands free to hold that important glass of bubbly, and that the closure is a bit dramatic without being too much. While the bag part of the equation is taken care of, what you carry inside is just as vital. This varies for everyone, but with these items, I always feel completely prepared without overstuffing my small purse. -My Iphone for my impromptu Instagram captures, tweeting and texting if I'm running late. -Elf lipgloss from Target in a sheer pink. -One of the chunky eyeliner/shadow sticks from Benefit. Staying power plus! -Make Up Forever's Rouge Artist Natural lipstick doesn't rub off on glassware, stays put and isn't too bright. I rotate about 3-4 shades depending on what I'm wearing. -PLa Beauty's Mineral Liquid Foundation (I pick it up at Woo Skincare and Cosmetics or Parlour 3 in Brentwood). I use this on my entire face almost every day, but it's also ideal for dabbing under eyes to wake them up and to clean up smudges throughout a late night. It's also my saving grace the next morning for hiding imperfections. -For a mirror and super smooth powder compact in one, Pure Pressed Base powder by Jane Iredale in RADIANT is my choice. Since discovering this skin brightener and smoother at Private Edition, I keep it in whatever I'm carrying, always! Just a swipe keeps oil at bay but causes the light reflect in all of the right places. 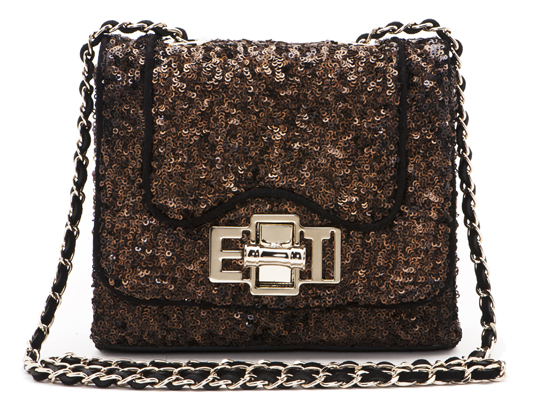 What is your favorite bag to carry to holiday parties? And what item do you include no matter what? I would love to see your thoughts and suggestions. Do keep following the Southern Sophisticate and share it with your friends. There's much more holiday to come!